Brennan and the Jeffersonian team are investigating a body found on the rocks under the New River Gorge Bridge. The slanted temporal bone, prominent nasal spine, and ectocranial suture closure suggest the individual was male and in his late 30s or early 40s. Numerous fractures are consistent with a fall from a great height. Based on insect activity, Hodgins places time of death at 5 to 6 days prior. Saroyan plans to take samples for a tox screen, then deflesh the body for Brennan to take a closer look at the bones. Brennan heads home for dinner and to put Christine to bed. Booth attempts to convince her to go on a family vacation to a cabin in the woods, but Brennan dismisses the idea as impractical with a toddler who won't remember the trip anyway. Booth accuses Brennan of lacking spontaneity, and Brennan decides to head back to the lab, walking out in the middle of their argument. At the lab, Brennan starts examining the bones. Hal the security guard pokes his head in to learn how it's going. Brennan tells him that injuries to his right supraorbital margin suggest he was murdered before being thrown off the bridge. She finds a fragment embedded in the sternum, but before she can examine it, she is shot by an unknown assailant. Booth shows up just in time, though, and gets her to the hospital. While Brennan is in surgery to find the bullet and repair the damage, she hallucinates seeing her dead mother. Saroyan is inexplicably scrubbed in for the surgery, and she's trading cranky barbs with a super sarcastic surgeon. Once Brennan is stable, Saroyan heads back to the Jeffersonian to autopsy Hal's body, as he was found dead in the stairwell, because they could not find a bullet in Brennan, nor an exit wound. Hal also has no trace of a bullet or exit wound, and the tissue around the bullet's path is cauterized. Brennan wakes up and complaints about coldness at the wound site, which leads Hodgins to suspect the killer used an ice bullet. Clark meanwhile notices the fragment Brennan removed from the sternum of the unknown victim, and Hodgins identifies it as a piece of taser prong, a match for Hal's taser. Angela's facial reconstruction leads them to identify the first victim as Johannes Groot, and Sweets and Blonde FBI Woman check out his apartment. It's nice, with very expensive tchotchkes and suits, and they find evidence of a struggle and numbered confetti from a taser. Hodgins has been doing experiments to see if an ice bullet could make the kind of injury seen on Brennan and Hal, but ice either shatters or melts when shot. He suspects that the bullet was made of something denser than water, namely blood frozen in liquid nitrogen. Saroyan and Clark continue to investigate Hal's body, and they notice an antemortem wound above the ear: it's infected, and the particulates inside the wound are sent to Hodgins, who identifies them as 12th century Cretan wood with gold paint. Angela retrieves the only 12th century Cretan artifact in the Jeffersonian's collection, an icon of the Archangel Gabriel, but there are no indications it was used to hit someone. Hodgins notices a small hair embedded in the paint, which his magical mass spec tells him belongs to a North American squirrel. They suspect the icon is a fake and think the Jeffersonian's restoration expert, Dr. Batuhan, may have been in cohoots with Hal and Groot to sell antiquities on the black market. Batuhan has no alibi for his whereabouts at the time Brennan was shot, and he has the means to make frozen blood bullets. Brennan goes in for another surgery, to remove the antigens from the posterior portion of her 8th rib, where the blood bullet embedded itself. When she comes out of anesthesia, we find out that the blood in Brennan was a match for Batuhan. He is arrested for murder and attempted murder. 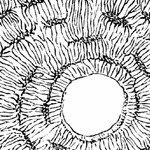 Ectocranial suture closure is a very imprecise method of estimating age-at-death. And I'm not sure how "slanted" temporal bone or "prominent nasal spine" got her to male. Bizarre. Brennan laid out Groot's radius and ulna wrong (as usual), not in anatomical position. 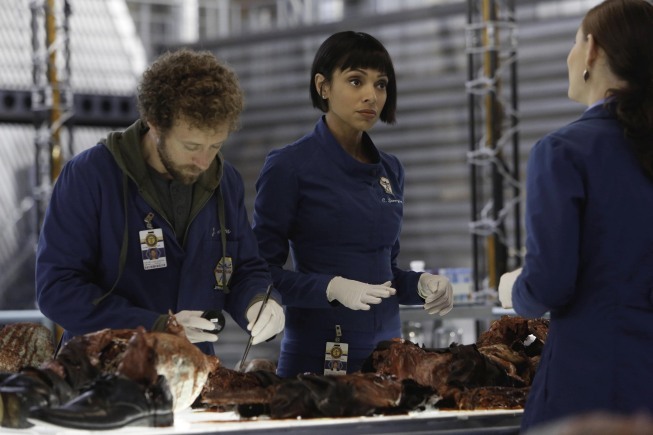 Love how Hodgins' magical mass spec tells him everything he could ever want to know about a tiny piece of fur. That's totally how a mass spec works. 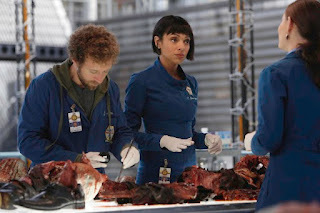 Hodgins also needs a mass spec to identify the fragments from Hal's skull, but when he sees paint flecks in Batuhan's lab, he doesn't even use a magnifying glass to assert they're the same. Soooo, anyone know if that's the way blood really works? I mean, a bullet made out of blood has, what, a tablespoon of blood in it? And the human body has around 10 pints of blood total. What are the chances that a small amount of blood of a different type would cause all the problems Brennan was having? I'm thinking this is wildly unrealistic, but I'm no expert in medicine. Also, can antigens "embed" themselves in bone? This is all very sketchy to me. New River Gorge Bridge? That's like 5 hours from DC. Hal drove 5 hours away to dump a bloody, decomposing body? Booth is supposed to be putting Christine to bed, not heading to the Jeffersonian. (I don't know about you, but I do NOT mess with my kid's bedtime, or I incur her wrath.) Also, when did he get his own access to the lab? Wasn't there some heated discussion a couple seasons ago, where Booth wanted unfettered access but the Jeffersonian wouldn't give him access to the forensics platform? Why would the lead surgeon let Saroyan scrub in for Brennan's surgery? And who would allow her to autopsy Hal, seeing how close she is both to him and to Brennan? The characters are all overstepping their boundaries this season, and it's not pretty. How many security cameras were disabled? Not all of them, clearly, or we wouldn't see footage of Batuhan leaving and then reentering his lab. Why didn't he disable that one too? How did the Jeffersonian people know that Hal was interested in Brennan's case? Was that before he turned off the security cameras? Or did Batuhan turn off the cameras? Why in the world did Batuhan use his own blood? I mean, it's way easier to get all the blood you need for making bullets from a butcher shop. And that can't be DNA traced to you. Duh. Wait, so, they found the fake icon in a storeroom, but Batuhan was working on the real one? And no one thinks to ask him, uh, why is there a fake? The entire plot is fairly ridiculous; I mean, if Pelant had returned and shot Brennan (or had someone else do it), that would make some sense. But introducing two new random characters and making them shady Jeffersonian coworkers is lazy writing. Would Brennan and Booth not resolve an argument? She's hyper-rational, which means sticking out a fight to talk it through. Also, Booth just wants a vacation; what's wrong with that? To Booth, "Your place is here, not working the case." Pot/kettle/black, Cam. Seriously. "I had to catalogue some papyrus Hellenistic epigrams; we're having an exhibit on the Posidippus scroll." - Some random woman who can't pronounce Posidippus or talk about epigraphy properly. "No one ever tests blood on the floor at a crime scene; they just sweep it away." - I think you mean "mop," Hodgins. Brennan told her mother twice that she loved her. Christine never said it back. That was kind of sad. Forensic Mystery - C-. This whole episode was quite confusing. I'm not sure they ever fully explained the mystery. Clearly, they'd figure out by the end who shot Brennan, and clearly she'd be ok.
Forensic Solution - D+. Blood bullet? Really? Also found it amusing that Brennan figured out in under 30 seconds what Groot's complicated cause of death was, when it normally takes them the better part of an episode. Drama - D. The scenes with Brennan's mother were snooze-worthy. The writers' heavyhandedness in showing Brennan she was wrong about an afterlife was excruciating. Most of the rest of the episode was simply bland... and full of glowing, sparkly fades. Eesh. They could identify the species of tree from a few small fragments? Why did Brennan need to go back into surgery to recover the blood. Wouldn't Hal have had some left over? Oh and dead Hal, I've seen better corpses in cheesy 80's zombie movies. Are they even trying anymore? Usually the only time when someone has blood of a different type is a very unlucky transfusion, where it would be a few pints - and that reaction happens very quickly. A tablespoon might not have a huge effect, especially as she was bleeding at the time (it might have been ejected with the rest of the blood). If it did, they definitely couldn't "go in and remove it" with another surgery - it would be diluted throughout her bloodstream at that point. It was a hallucination. 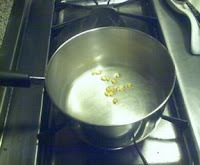 That does not prove heaven exists. I don't think that Brennan stopped being atheist because of it. Other characters might think that it was heaven, but Brennan is clearly shown as thinking it is a hallucination, also, though it is unfair of me to use this as you wrote the review at the time that this episode aired,Brennan was shown to be atheist or at least highly agnostic in later episodes.